First, please be sure you have a Facebook Advertising Business Page, not a Facebook fan page or personal account. If you have not done so already, you should visit http://business.facebook.com and create an account there first. Next, please log in to your LeadsTunnel members area. 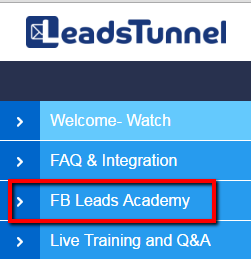 From there, you will see a left-hand navigation menu that contains a tab labeled 'FB Leads Academy'. This tab contains training videos with basic instructions on getting Lead Ads set up within your Facebook account. These training will teach you exactly how to get started with Lead Ads! In addition, we have a link to the Facebook Lead Ads Page with more about Lead Ads and Lead forms, and a step-by-step instructional for creating a Lead Ad campaign here.